Is Brendan Rodgers heading out of Liverpool FC? The Sun and the Daily Mirror each have a take on the story. 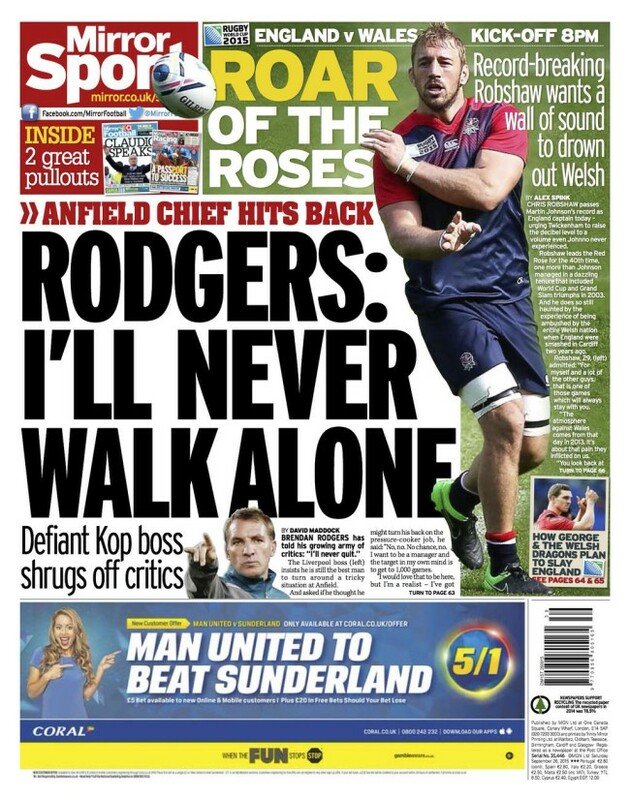 BRENDAN RODGERS’ biggest fight is against the enemy within — not the critics determined to see him sacked. They say you never walk alone at Anfield but the Liverpool boss is becoming isolated from his Fenway Sports Group employers. Ahead of tomorrow’s must–win clash at home to struggling Aston Villa, the sound of silence from principle owner John W. Henry and chairman Tom Werner is deafening. Have Fenway Sports Group backed him or not? The Mirror says ‘yes’ the Sun says ‘no’. Rodgers is defiant and resigned?